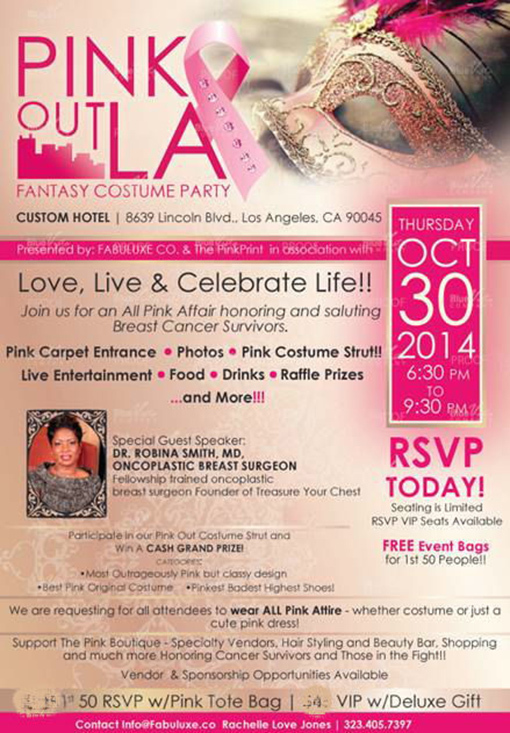 Los Angeles, CA October 8, 2014 - -¬ Rachelle Love Jones, creative director and couture event stylist of Fabuluxe Co.™ is excited to present #PINKOUTLA | A Fantasy All Pink Costume Soiree – to honor Breast Cancer Survivors in recognition of Breast Cancer Awareness month. The event will take place at the Custom Hotel, 8639 Lincoln Blvd, Los Angeles, California. Thursday, October 30, 2014 – 6:30 PM. Event will begin with Pink Carpet Arrivals, Pink Signature Cocktails, VIP Reception, A Pink Boutique, featuring specialty vendors, offering unique products and services. Ladies are encouraged to wear all pink attire. Come get pampered at the beauty bar, participate in the costume strut; win a cash grand prize and other fabulous gifts. We are excited to have our generous partners and sponsors onboard, which include: Custom Hotel, PF Changs, MAC Cosmetics, Victoria Secrets, Younique Cosmetics, DavaHart Designs, Tears of Joy Events, Hey Girlfriends Network, Monique Hogan Weddings & Events It Works, Ardysis International and a host of others. About Rachelle Love Jones, Fabuluxe Co.
Rachelle Love Jones, MBA founder of Fabuluxe™ Co. and creator of the Pinkprint Branding Academy™ allows her passion for all things glamorous to shine with brilliance. Offering over 20 years expertise in event design, styling and planning, her desire to empower women through helping them celebrate life in a fashionable way creates an irresistibly style. Rachelle’s eye for opulence and use of custom-designed props, lush textiles, unique elements, and ornate décor has made Fabuluxe synonymous with impeccable, gorgeous, original events. More importantly, Rachelle’s high-level concierge approach and keen understanding of time and planning have earned her clients’ accolades. Exclusive vendor and sponsorships opportunities are available to showcase and give back in a fun, yet creative positive atmosphere.